With support from the Assessment for Learning Project, Future Focused Education aims to influence assessment reform at the state level and to expand the use of performance assessments throughout New Mexico. The time is ripe to remodel our student assessment system to better support teaching and learning. 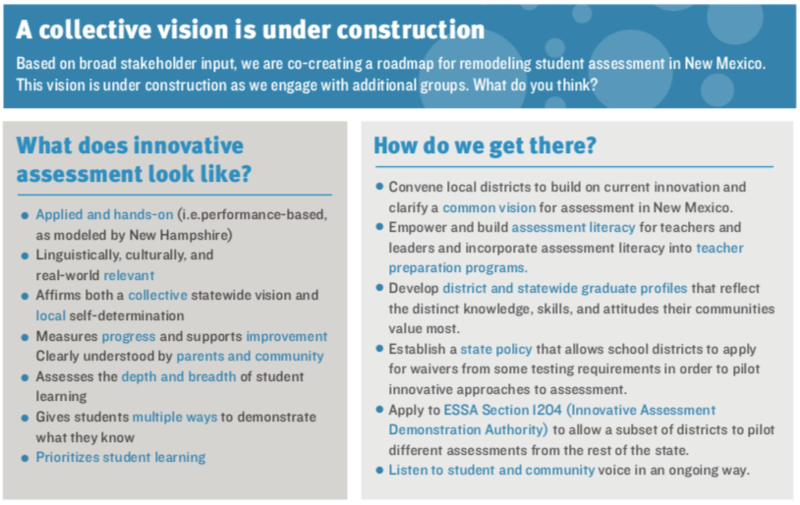 We believe performance assessment models, similar to the Performance Assessment of Competency Education (PACE) initiative in New Hampshire, hold promise for our state. Building on our New Metrics initiative and legislation passed in 2017, Future Focused Education is convening stakeholders around New Mexico for facilitated discussion and visioning sessions on the future of student assessment in New Mexico. "You've given us ideas, hope, and strategies for shaping positive change in New Mexico." "Let's rethink required assessments and what they are used for. Use them to improve curriculum and instruction not to punish kids and systems." "Meaningful. Coherent. Connected to student needs."